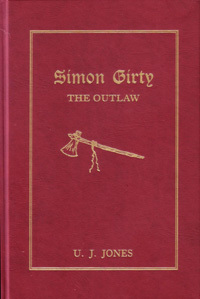 With a Biographical Sketch by A. Monroe Aurand, Jr.
Modern historians debate the accuracy of the facts about Simon Girty’s life, but without this biography penned by U. J. Jones in 1846, much of the information on this legendary character from the early frontier would have been lost. Born in 1741 near present-day Harrisburg, PA, Girty's legendary life reads like a tale of romantic tragedy. At the age of 10, his father was murdered by Indians. At age 15, his stepfather was burned at the stake before his very eyes. He was adopted by the Senecas and spent the next decade living among them in northwestern PA, learning their language and culture. In 1771, Girty resurfaced near Fort Pitt where he made a name for himself as a capable frontier scout, interpreter and spy for the Americans. His life along the Ohio River helped him make permanent ties with both natives and whites and he served as a frontier scout during Lord Dunmore's War. In March 1778, while serving as interpreter for General Edward Hand during the infamous "Squaw Campaign", Girty became disgusted by the wanton killing of women and children and defected to the British. Girty, however, achieved infamy by his participation in the torture and death of American Colonel William Crawford at the hands of Delaware Indians. The incident established Girty’s reputation as a "white savage"--a reputation he would enhance by leading countless Indian excursions against the Americans after the Revolutionary War. After Detroit was ceded to the Americans in 1796, Girty fled to Canada where he died blind and destitute in 1818. In December of 1741, Count Zinzendorf came to Philadelphia via New York to begin a remarkable journey through the wilderness of America searching for the original peoples—the Indians of the Eastern Frontier. As the newly recognized head of the Moravian Movement among the Indians of the New World, this amazing man labored far into the frontier, traveling extensively to meet with tribal leaders such as Shikellimy, Teedyuscung, and Tatemy. Through the eyes of this man of the cloth are related narratives that speak to us today, giving us glimpses in that moment in time of what life was really like on the frontier of 1742. Zinzendorf may have failed at baptizing many Indians to Christianity, but he paved the way for David Zeisberger and John Heckewelder to live among the Delaware and unknowingly helped preserve for posterity the ways of the Indians of the 18th century Eastern Frontier. Colonel Henry Antes was a key figure in the development of the Pennsylvania frontier in the late 18th and early 19th centuries. This remarkable man, who played such an important part in the history of the West Branch of the Susquehanna Valley was born in 1736 in Montgomery County, PA. Settling in the Susquehanna Valley as a young man, he was commissioned lieutenant colonel of the Fourth Battalion in May of 1777. On the point of a high bluff, just below the mouth af Antes Creek, Col. Antes built a stockade that was frequently occupied by settlers for their safety on the frontier. Originally published in 1900, Edwin MacMinn enlightens the reader with this valuable history of a Pennsylvania militia commander and his pioneer family on the West Branch of the Susquehanna. 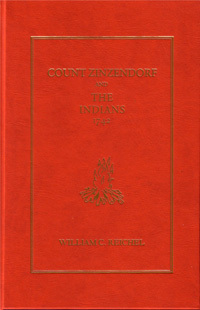 Chapters contain information on Indian traditions, Indian village life, customs and traits of Indian character, sickness, death and treatment on the frontier, home life of the early settlers, early modes of transportation, treaties with the Indians and much more. MacMinn's accounts of Indian massacres and the "Big Runaway" on the Susquehanna's West Branch are invaluable and his discussion of the role of women, culture and character of the Pennsylvania frontier people are stories rarely found in the early histories. First published in 1945, this biography chronicles the life of Conrad Weiser, Pennsylvania’s Indian ambassador. Born in Germany, he grew up in the Hudson and Mohawk valleys of New York and as a youth lived several years in a Mohawk village where he learned the language. By the 1720s, he and his family moved to Pennsylvania where he was employed as an agent and interpreter. Over the course of his long and distinguished career he was a trader, colonel in the French and Indian War, first President judge of Berks County and founder of Reading, PA, monk at the Ephrata Cloisters, pillar of the Lutheran Church, statesman, linguist, diplomat, and woodsman. Governors, churchman, and Indian chiefs all relied on his advice. Indeed, it was his work as an Indian agent that made his fame lasting. The Iroquois named him Tarachiawagon—“He Who Holds The Heavens.” His long career serves as a colorful introduction to this fascinating period of colonial history. This collection, first published in 1958, follows America’s most observant early traveler, John Heckewelder, through the eastern woods as he recorded invaluable observations on the Indian life and pioneer history of the early frontier. From 1754 to 1813, Heckewelder crossed the Allegheny Mountains 30 times and his adventures along the Indian trails of Western Pennsylvania into the “Ohio Country” are interwoven with the movements of the Moravian Indian missions. He lived among the Indians for almost sixty years, learning their language, sharing their activities, recording clearly and vividly what he saw and heard, being most at home with the Ohio Country Indians. William Trent's career was full of pulsing romances, forest diplomacy, and 18th century colonial politics. Trent was deeply involved in the expansion of the early frontier westward into Ohio country and this biography chronicles his participation in the great events of the time. In his early years, he was a soldier of fortune, enrolling in the militia to fight the French and Indians. He was with General Forbes, Colonel Bouquet, and Major Washington as they chased the French at the forks of the Ohio. He was part of the founding of Pittsburgh and later in life was an Indian trader, diplomat, and land speculator. Statesman, entrepreneur, and adventurer are but a few ways to sum up the life of this extraordinary figure of the 18th century frontier. George Croghan is perhaps one of the most fascinating of the great American early frontiersmen. Arriving in America in 1741, Croghan soon became one of the most prominent Indian traders. When his Indian trade failed, Croghan acted as Washington's Indian agent during the Ft. Necessity campaign of 1754. The next year, he survived Braddock's fateful batter and helped organize the defenses of Pennsylvania's western border. He took part in several other campaigns during the French and Indian War as well. His ability to understand and treat with the Indians was unsurpassed. Though he once promoted an Indian uprising against the French, he was also considered a superlative peacemaker, having negotiated treaties with Teedyuscung and pacified Chief Pontiac. Though he died despised and penniless in 1782, Croghan must be ranked among the most intriguing of the early frontiersmen.